Previous image, 17 total items. Next image, 17 total items. Peruse the thousands of stalls to find Chinese arts, crafts, memorabilia and antiques at Beijing’s largest and most famous antique market. The Panjiayuan Antique Market is Beijing’s largest antiques market. Every day, hundreds of sellers offer their fascinating collections of curios, art, antiques and collectibles to around 50,000 visitors. Even if you don’t plan on spending, consider going to simply browse and to observe the action. The market is a hive of activity at any time of the day, with sellers hawking their wares and regaling stories of their precious items’ pasts. If you are searching for something specific, it’s best to head down early; this is when shoppers have the best chance of finding a precious treasure. Practice your bargaining techniques and don’t pay the first price offered. Haggling is common practice in Chinese markets and Panjiayuan is no exception. It is done with good nature and enthusiasm so get stuck in and give it a try. Walk around the market before buying anything and compare prices on similar items to get a better idea of what price to push for. The market covers 520,000 square feet (48,500 square meters) and is packed with all kinds of varied goods. Discover everything from Chinese paintings to calligraphy equipment, traditional Chinese musical instruments to antique furniture. Crafts from ethnic minorities such as Hui, Miao, Korean and Manchu can often be seen here, and the market contains small shops selling jewels and jades. Buy yourself some old People’s Republic of China propaganda to take home, or treat yourself to a piece of beautifully adorned porcelain. For something easy to pop in your suitcase, opt for delicate papercut crafts, textiles or a small piece of silver. The Panjiayuan Antiques Market is located just west of Panjiyuan Bridge in the Chaoyang District. The easiest way to get there is by subway and the Panjiayuan subway station is a short walk from the market. The market is open daily, but it’s at its biggest and busiest at the weekends. Get there early to see the best selection of goods before they are snapped up. Silks, electronics and bargain fashions are just some of the wares on offer at this busy multi-level indoor market. Climb the steep steps to the top of these ancient Beijing landmarks to learn about their history and enjoy panoramic views over the old city below. View the entombed body of Chairman Mao Zedong, which rests within his vast mausoleum in the middle of the famous Tiananmen Square. Enjoy panoramic views over Beijing and a sunset dinner in a rotating restaurant at the tallest landmark in the city. One of the most famous squares in the world, this spot is the beating heart of Beijing and has always been the site of mass protests and national celebrations. Pose next to some very alive-looking tigers, race a dinosaur on a bike, visit the aquarium and research the evolution of humans and plant and animal species. This formerly restricted imperial palace complex is now a public museum that shows the splendor of the old China. It is one of Beijing’s most impressive sites. This grand structure was the original front gate to the once-walled city of Beijing. Climb to the top for fantastic views over its archery tower and Tiananmen Square. Behind a high wall stands an ancient building once used in sacrifices. This huge historical place of worship is a quiet oasis in busy Beijing. This idyllic public park was once the summer retreat of the Qing Dynasty. It houses the iconic Boat of Purity and Ease. Created more than a thousand years ago as an imperial garden, this huge green space wrapped around a lake is an oasis in Beijing’s bustling city center. Visit one of the finest places of worship in Beijing, which is still an active Buddhist monastery, to see frescoes, huge Buddha statues and Chinese decorations. This impressive bridge with hundreds of lion sculptures has gained world fame as the site of a clash between Chinese and Japanese troops. In one of the largest museums in the world, the amazing collection of valuable relics include rare bronze and porcelain objects, jade artifacts and artworks. Get the best views of central Beijing, the Forbidden City and the White Dagoba in Beihai Park from the hill in this former royal garden. These once extravagant imperial palaces and gardens were all but destroyed in the 19th-century, but the crumbling ruins are still worth visiting. Find the latest fashion or cheap souvenirs and sample local cuisine in this bustling pedestrian-only street, one of the city’s most popular shopping strips. See terracotta warriors, ancient temples and Ming Dynasty architecture at the Juyongguan section of one of the most spectacular tourist attractions in the world. Join locals as they enjoy downtime at one of Beijing’s prettiest locales, characterized by its lakes, old houses, vibrant nightlife and outdoor activities. Constructed for the 2008 Summer Olympics, this hub of stadiums and sporting arenas features the landmark Bird’s Nest Stadium, a water park and mall. 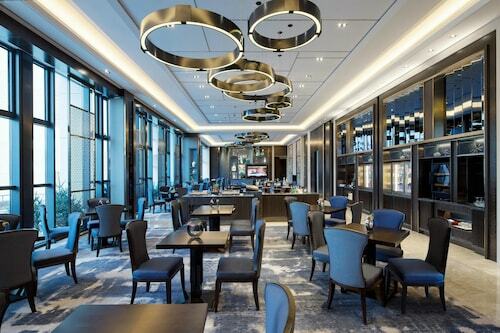 Located in Beijing Central Business District, this luxury hotel is 0.3 mi (0.5 km) from Silk Street Market and within 3 miles (5 km) of Sanlitun and Wangfujing Street. Tiananmen Square and Tiananmen are also within 3 miles (5 km). Yong'anli Station is 7 minutes by foot and Guomao Station is 9 minutes. 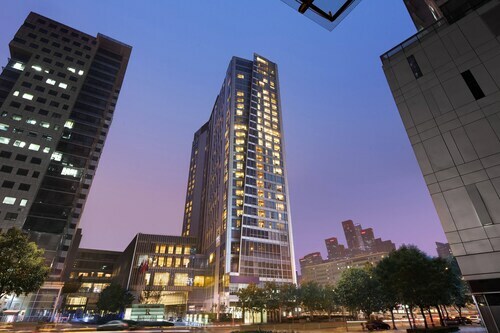 This family-friendly Beijing hotel is located in the business district, within 3 mi (5 km) of CCTV Headquarters and Gui Street. China Museum of History and Chairman Mao Memorial Hall are also within 6 mi (10 km). Yong'anli Station is 10 minutes by foot and Jintaixizhao Station is 12 minutes. 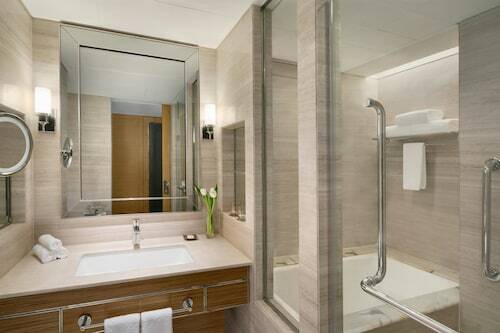 Located in Chaoyang, this luxury hotel is 1.3 mi (2 km) from China World Mall and 2.6 mi (4.2 km) from Sanlitun. 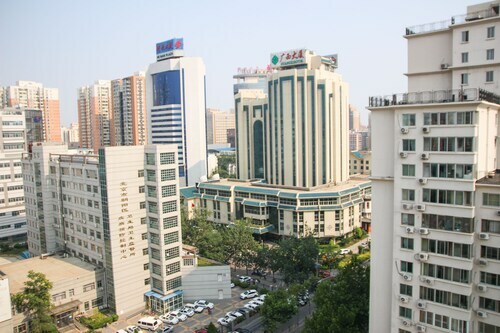 China World Trade Center and Panjiayuan Antique Market are also within 2 miles (3 km). Shuangjing Station is 9 minutes by foot and Jinsong Station is 23 minutes. Located in Panjiayuan, this hotel is within a 15-minute walk of Panjiayuan Antique Market, Panjiayuan Market and Beijing Curio City. Beijing University of Technology and Beijing Yansha Outlets are also within 3 miles (5 km). Jinsong Station is 15 minutes by foot. Located in Panjiayuan, this guesthouse is 0.4 mi (0.6 km) from Panjiayuan Antique Market and 2.8 mi (4.6 km) from Temple of Heaven. Panjiayuan Market and Beijing Curio City are also within 1 mile (2 km). Jinsong Station is 13 minutes by foot and Shuangjing Station is 29 minutes. 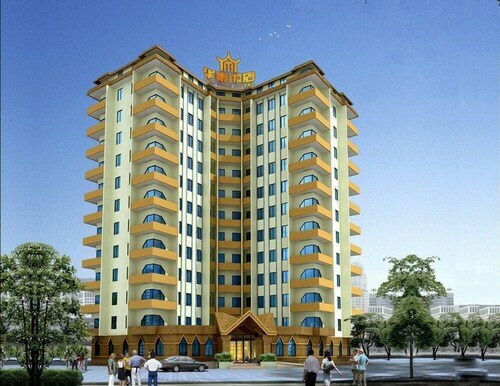 Located in Panjiayuan, this hotel is 0.5 mi (0.8 km) from Panjiayuan Market and 2.6 mi (4.2 km) from Temple of Heaven. Panjiayuan Antique Market and Beijing Curio City are also within 1 mi (2 km). Jinsong Station is 7 minutes by foot and Shuangjing Station is 20 minutes. 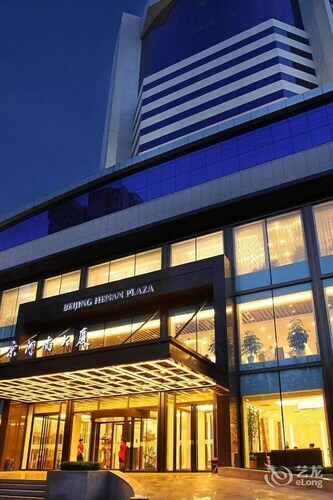 Located in Chaoyang, this hotel is within a 15-minute walk of Beijing Curio City and Panjiayuan Antique Market. 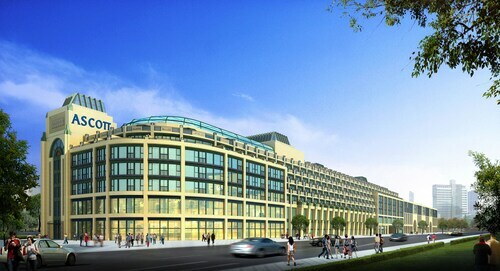 Panjiayuan Market and Beijing University of Technology are also within 2 miles (3 km). Jinsong Station is 21 minutes by foot. This family-friendly aparthotel is located in the city centre, within 1 mi (2 km) of Panjiayuan Antique Market, Beijing Curio City and Panjiayuan Market. Beijing Yansha Outlets and Beijing University of Technology are also within 1 mile (2 km). Jinsong Station is 25 minutes by foot.